Hello new friends! 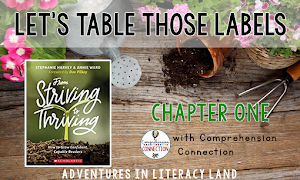 I am very excited to be joining a wonderful group of teacher bloggers as we embark on this new Literacy Land adventure. I began my journey in education as a middle school social studies teacher. I went to a professional development about incorporating reading strategies across content areas and I started thinking that maybe I wanted to teach reading instead. That opportunity arose in my district and I became the seventh and eighth grade reading teacher. Did I have any idea how to teach reading? NO! So I went back to school and got my master's degree in reading. After teaching reading for a few years, I was given the opportunity to become a literacy coach for grades 4-7. While I was coaching, I achieved National Board Certification in Reading/Language Arts. Currently, I am a Master Teacher (instructional coach/facilitator...there are so many names that mean the same thing) for grades preschool through third grade. As part of my job as a master teacher, I have to analyze our test data to determine an area that needs to be focused on school-wide. Once I have narrowed down the focus, I research strategies that would help our students succeed in that area. One of the great things about my job is that I don't just tell my teachers, "Go try out this strategy because this book/article/website said it would work." I have to field test, or try it out, first with a group of students in our school. Once I work the kinks out of the strategy, I present it to my teachers in manageable chunks. Looking at the data, we were struggling with creating a piece of writing that stayed on topic and was organized. What to do? 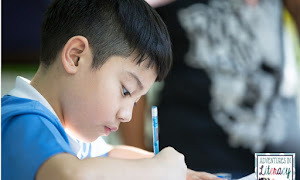 I researched and found the four square writing method and began to try it with the first grade students my first grade teacher graciously loaned to me. 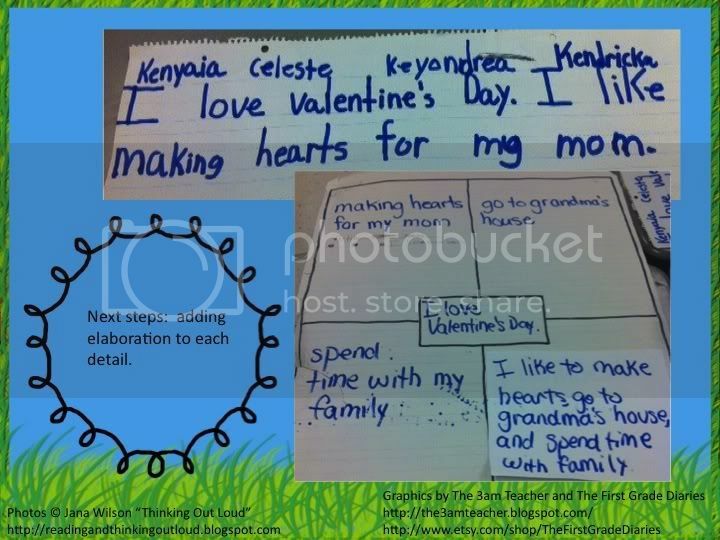 We worked on using the graphic organizer for a couple of weeks before we picked one of the graphic organizers and wrote our first piece of text. It doesn't matter what grade I teach, I am always impressed by the power of modeling. 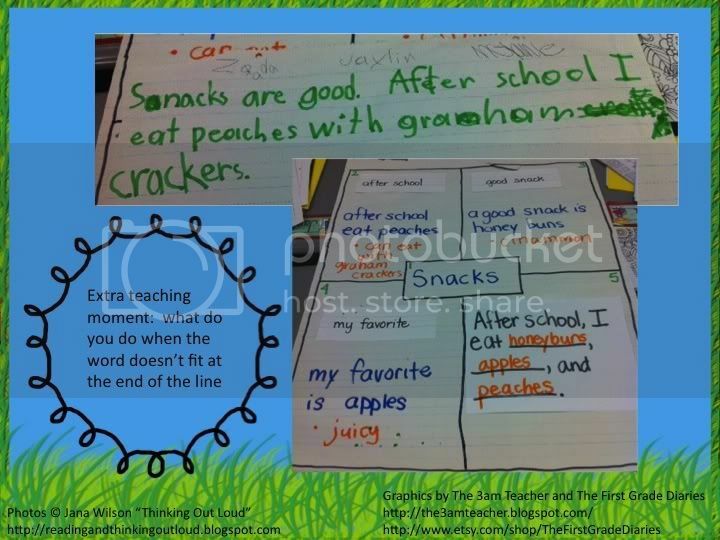 I modeled how to turn the information in the graphic organizer into sentences to write the paragraph. In the next lesson, the students and I worked together to start our paragraph. We used a graphic organizer that we had previously completed together. We only focused on the topic box and the first detail box. The next lesson took the remaining boxes and turned them into sentences. I wanted to take a piece at a time, so I had the opportunity to assess them before we wrote the whole paragraph. Before taking the plunge and having the students write their own paragraphs, I wanted to give them more practice by working together in groups. Each group was given a different completed graphic organizer (each one had been completed during guided practice earlier in the unit). They were also given a half-sheet of chart paper and a marker. The groups had to write the beginning of the paragraph that would match their graphic organizer. After they completed the beginning of the paragraph, I assess by reading and writing down next steps. 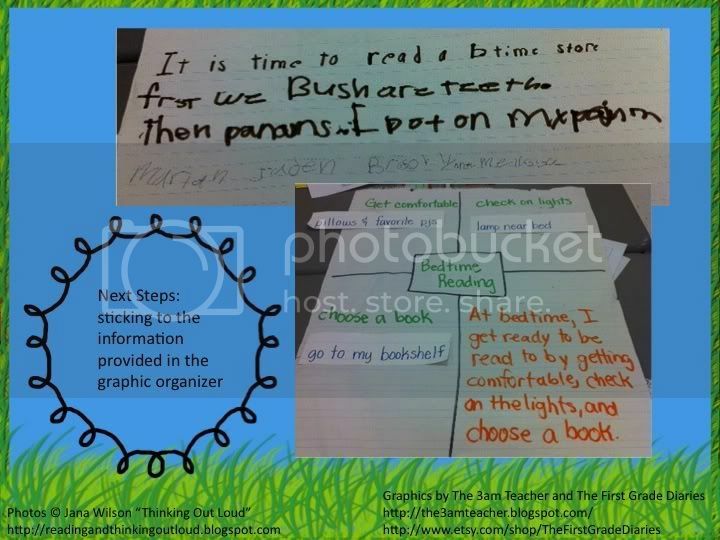 I used the next steps to plan my small group writing time. Are these the best sentences ever? No. Could they use some style? Yes. Am I happy with the product? Yes! Our goal has been to make sure that the details they use in their writing match the topic. The next steps are to finish this draft, revise, edit, and write a final published copy. The published pieces are going to be displayed in the hallway. All we are working on is content and I am pleased with our beginnings. The students were excited about working together to create a piece of text. One group finished quickly and asked for another graphic organizer. They wanted to keep writing! I left school with a smile on my face thinking about how excited they were to write. 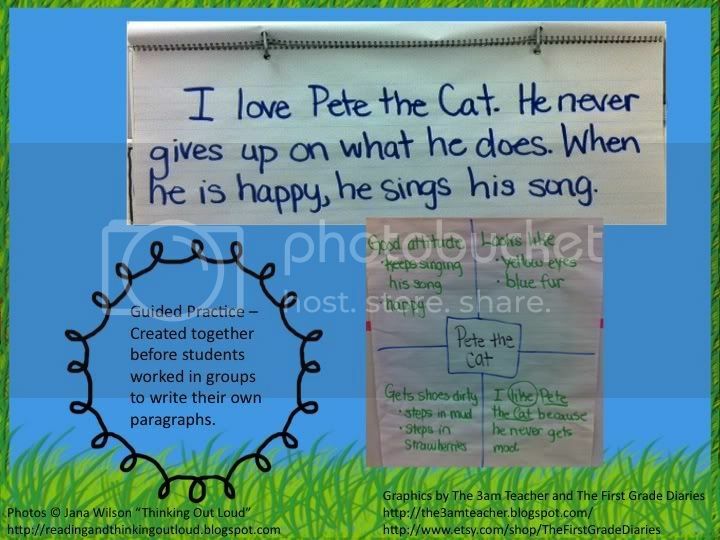 Now that students have experienced success creating a piece of text with a group, it is time to move them into independently going through this process. 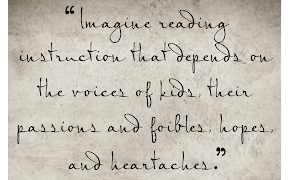 I would love to hear how you help your students organize their writing and stay on topic. Let me know in the comments. What a great post about 4 square writing! One of the authors came to my school one year and it completely changed the way that taught writing (I was a second year teacher then and really needed some guidance!) I love how simple and effective the organizer is! Thanks! I love the 4 square writing organizer, and our school used to use it. The only problem is that 4 of us attended the training and then trained the rest of the staff. Then we had a huge turnover, and no one was doing it correctly. I really wish we would go back to it, especially for the lower grades. It seems that we can't stick with one thing for long before something new comes along! Thanks for reminding me of 4 Square. I may use it with some of my struggling writers. Andrea...have you seen the Four Square Powerpoint that steps through how to expand to 5 paragraph essays? 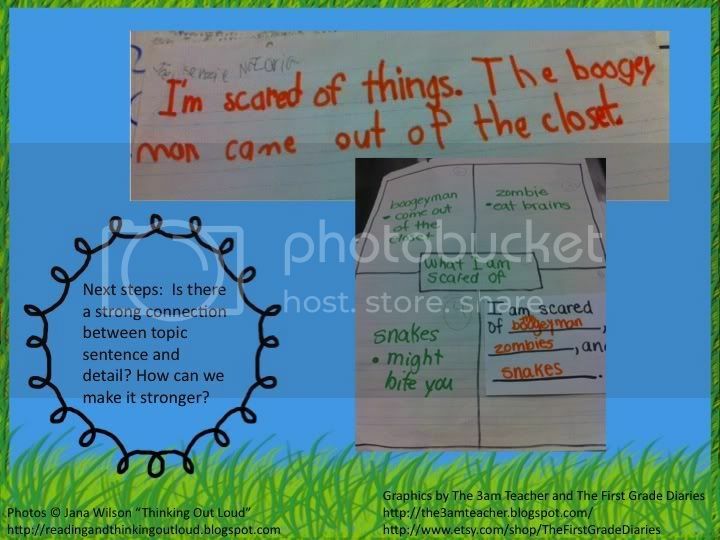 I have used it very successfully with my students this year, and highly recommend those new to four square to go through the powerpoint to prepare themselves and then use it to model for students. I will post it below. Link to Four Square Powerpoint Explanation Jana...I loved this detailed explanation. Four Square is definitely a writing method all teachers should learn about and be familiar with. What a great post! 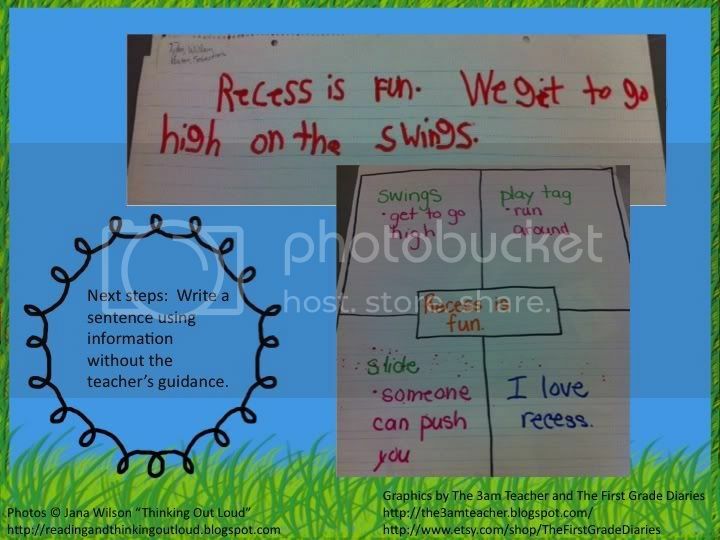 I love using four square to help young writers organize and elaborate on their ideas. We use a program called Step Up to Writing in my district but I want to try to incorporate the Four Square model into my instruction more. Thanks for this post! We use the Four Square Model alot! With the standardized writing test that we have in Virginia, that has become one of the favorite strategies of our upper elem teachers. I try to also incorporate it in first grade so that they have exposure to it.